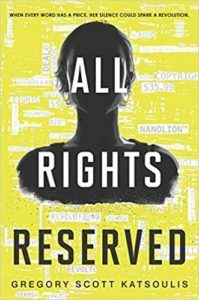 I am reading All Rights Reserved by Gregory Scott Katsoulis. Dystopian YA exploring themes of intellectual property and free speech. In this world everyone has to pay for every word they say after their 15th birthday. Speth Jimes decides to take a stand and reserve her right to remain silent. I lay awake at night trying to conjure a sentiment so fine as that.